But this time, I made an exception, because Miss Jennifer was getting married. We met her six years ago at Picture People, and right away she started to babysit for us. She cleaned up messes and helped potty train Henry and read The Chocolate Surprise during her weekly visits. She was amazing, and eventually, Joe stole her to work at his office. But she remains a special part of our family, especially for Jack. I always want us to look together for these things. I bought the matching plaid shirts and we combed the matching hair, but somehow, someway, on the ride there, the hair started to stick up in weird places and the plaid shirts crumpled and untucked. As we pulled into the lake house, we gave the talk; the instructions for the day. Keep quiet during the ceremony, do not touch the bride or her dress, and no fingers on the cake. We did not, however, have the prudence—the foresight—to warn about a kayak. Jack’s been really tough for us lately. I’m not even sure how to describe his behavior. He’s impulsive and determined and a little belligerent. He has this new independent streak going on, but not a lot of judgment to temper it. Basically, he’s a 10-year old boy with autism. And he tends to look, well, how shall I put it? He looks very special in these situations. I feel bad saying that but it’s true. Those of you with non-special children may find that inappropriate, and those of you with special kiddos in your life may be offended, but I don’t know any other way to describe it. Trust me when I say that we are not embarrassed by him. If anything, his stimming is part of my background noise, the tympani of my day. But I am mindful that other people may or may not want their wedding vows punctuated by a ten-year old boy shouting something he heard Sponge Bob Square Pants say. We got through the ceremony okay. Henry’s pants stayed up and Charlie dropped the frog he caught just before the music started. Jack rocked a few times but otherwise remained quiet, and tween Joey didn’t roll his eyes once. Rose stood motionless, in awe, as the bride walked down the aisle in her long white gown. Afterwards, we filed into the reception area to admire the decorations and décor; the bride and groom’s initials in bright yellow, flowers tied with ribbons and candles in glass bowls. The personal touches! The details! Weddings like this make mine look as though we got married in a big box store under fluorescent lighting. This wouldn’t have been so bad, given the circumstances, except her sister’s name is Dawn. And the cake! Please, the cake. The cake was set in the middle of the dance floor during lunch, all three yummy tiers of it. For the rest of the meal we yelled at Jack to get away from it, because nothing, says “Congratulations! You’re married!” quite like a boy with autism stimming into the wedding cake and knocking it to the floor. Then there was a wooden bench that the groom made by hand. It was beautiful. It was symbolic of family, strength, and everlasting love, and after lunch the bride’s brother announced that everyone should write a special message and sign their name. 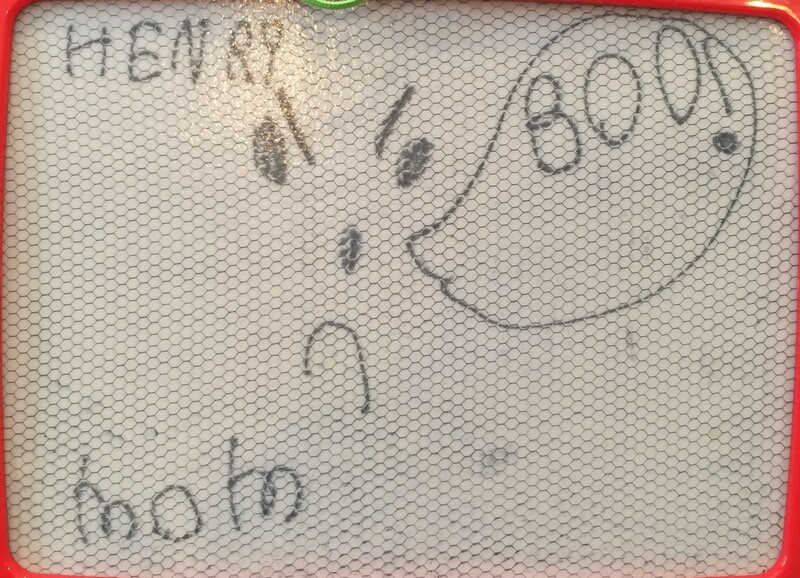 Henry drew this because he was mad I wouldn’t let him have more Cheez-Its. When the dances were finished, everyone headed outside to enjoy the beautiful weather. The men took off their ties and loaded kids into paddle boards and canoes for a quick trip around the lake. I sat on the boathouse with Rose in my lap, soaking in the sun and talking about what kind of wedding she’d like to have. I looked towards shore and saw Jack pulling a kayak off of the sand. “Jack? No buddy, we aren’t going to take that out. Those tip really easily.” He looked up and nodded, and satisfied that he’d understood my answer, I turned back to Rose. Mid-sentence, I was interrupted by a high-pitched shriek I’d recognize anywhere. I looked back to the shore to see Jack standing—drenched—in two feet of water, screaming in front of fifty-plus people with the kayak tipped over by his side. 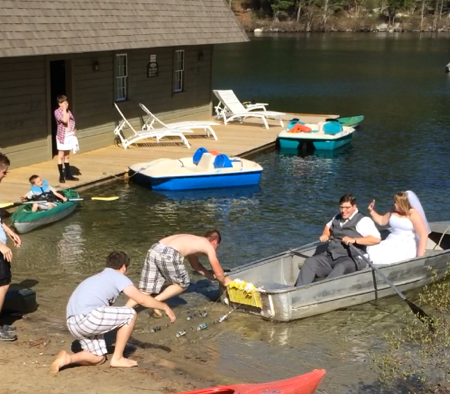 At the end of the reception, after the top of the cake had been preserved for the first anniversary and the last picture taken, the bride and groom climbed into a rowboat and paddled off into the sunset. The next morning I caught Jack trying to plug the waffle iron in after I told him to wait for my help. I curled my lips around my teeth and hissed, “Remember the KAYAK!” and he jumped back, startled by the memory. “I tipted it over,” he remembered sadly. Huh, I thought to myself. Maybe he learned something. Maybe the memory of the kayak sliding out from underneath him and the cold rush of water and wet pants will help keep his impulses at bay. For now, anyway. That night Joe and I watched the video he took of the bride and groom sailing off on the lake. And we almost fell off the couch laughing. Because standing on the boathouse in the background is none other than Jack himself, white towel clutched around his waist, black dress socks pulled to his bony knees, waving his little heart out to his favorite person in the world. I love this story! You need to submit it for some kind of a collection. Really. It was thrilling, really, to experience Jack in all his autismal (is that a word?) glory. He really is (as all your kids are) terrific! It didn’t bother any of us that he was stimming and dumping kayaks :). Jen was delighted to have her favorite kids there (minus one niece) and as her sister, I know that she loves them as much as they love her. Thank you for letting us share you all for a day. It really wouldn’t have been the same without you there. I would like I borrow that kayak. Jack AND Jennifer are blessed to have each other in their lives. This is a fantastic piece, friend. This is really beautiful and so sweet that your kids are family to this couple. They really had such precious wedding ideas too. These really are the stories that make it a memorable day. The whispered scream and threats of what I was going to do letter made very quietly in little ears were my main weapons as a parent of three boys. None of mine were ‘special’ unless you count specially unruly, but I guess kids are much the same no matter what. I loved this story Carrie! And I do believe we all have “special” moments in life! You and Joe are great parents, and are raising great kids. Blessings.